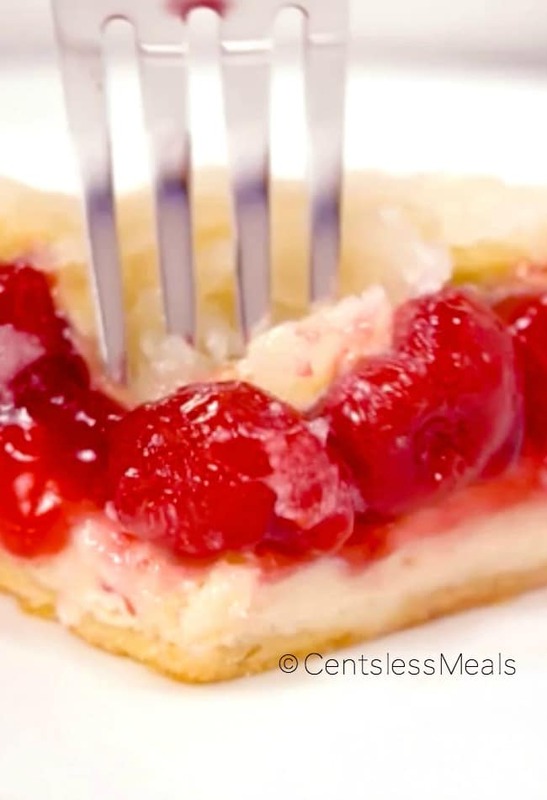 Cherry Cream Cheese Bake is a simple and easy dessert that everyone loves! Layers of smooth cream cheese, sweet and tart cherry pie filling and crescent rolls are topped with a delicious sugary topping. The results are amazing! 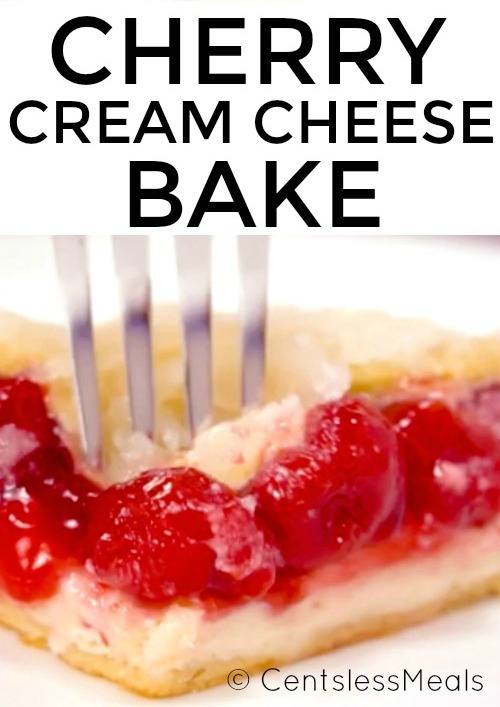 If you are short on time, this Cherry Cream Cheese Bake recipe is fast, easy and delicious! It takes only 5 minutes to prepare and only 25 minutes to bake! The result is an amazing dessert your family will love and ask for again! 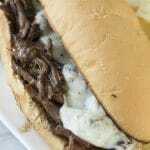 Be sure to follow CentsLessMeals on Pinterest ! Layers of rich smooth cream cheese, luxurious pie filling are topped a delicately crisp crescent roll crust combine to create a texture combination hard to resist! The ingredients are simple and combine easily, everyone will think you spent hours in the kitchen, only you will know the truth! Unsalted butter is best in this recipe, however you can use margarine if it is all you have on hand. 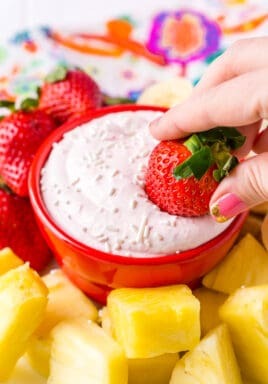 Mix the cream cheese until very smooth and fluffy. You’ll want to make sure the cream cheese is room temperature. You can always put the cream cheese in the microwave at 50% power until softened. (Be sure to remove the foil packaging first). 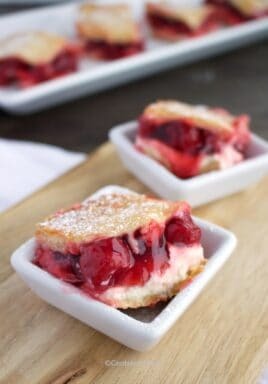 Whatever you do, don’t skip the final step, the sprinkling of sugar and butter is what creates the amazing crunchy texture in this Cherry Cream Cheese Bake! I sometimes even add a little bit of lemon zest into the sugar for a dash of freshness! Your dessert will be delectably browned with a perfect crispy texture that will make your mouth water. Since this recipe is so incredibly easy, my kids love to help out with the mixing, spreading and pouring! They’re always so pleased with their yummy creation and happy to share it with everyone! What a sweet way to end the evening! 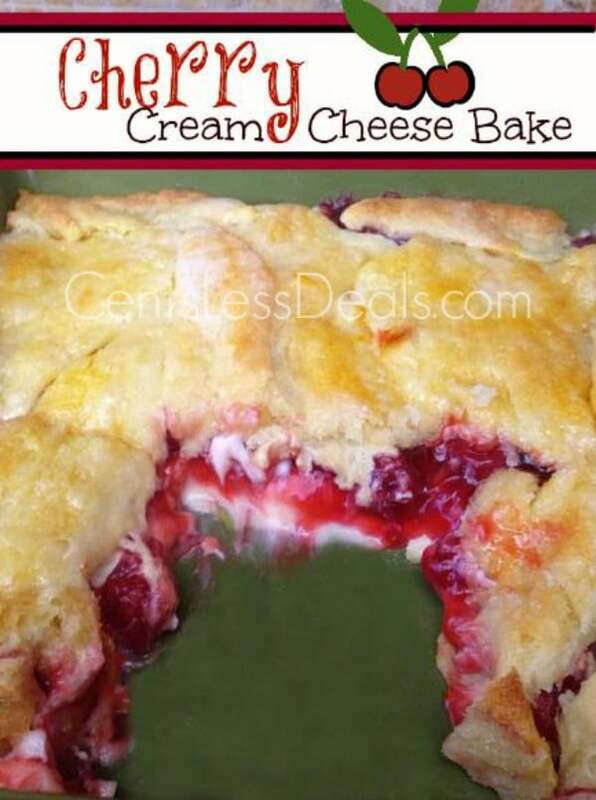 Cherry Cream Cheese Bake is so easy and delicious! Cream cheese, pie filling and a crisp crescent roll crust make this a delectable dessert! Top with granulated sugar and bake for 25 minutes or until browned. 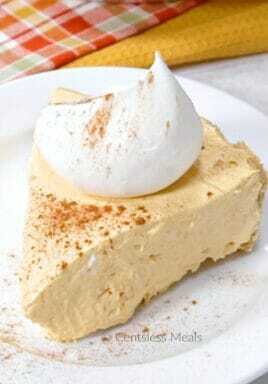 « Previous PostCreamy Lemon Pie recipe with only 4 ingredients! Really fast, easy and delishous!! So glad you loved it Tracee! Has anyone tried this recipe with puff pastry dough? I have not, but maybe another reader has Linda! Tried recipe, disaster, followed directions to the letter, crescent rolls never cooked, cream cheese is soupy, very disappointed, it was edible but very gooey. even baked it an extra 30 minutes, top would not brown and bottom crust was soggy. Leona, I can’t say what went wrong for you, as we’ve made this many times and it’s turned out perfectly. Thank you for trying the recipe. I make this all the time and love it, I do bake the bottom rolls for about 10 mins or till light brown let it cool then put the cream cheese mixture and cherries on. I only brush with butter and sprinkle with sugar. Have had nothing but good comments on it. Thank you for sharing Judy! So glad to hear that you love this dessert. This recipe doesn’t work as it is posted. Dough does not cook completly ehen covered with butter. I even added 20 minutes bake time, then had to blast with broiler to get it near done. I’m sorry that this recipe didn’t work for you Edward. We’ve made this many times with great success, as have many readers. I can’t say what went wrong for you. 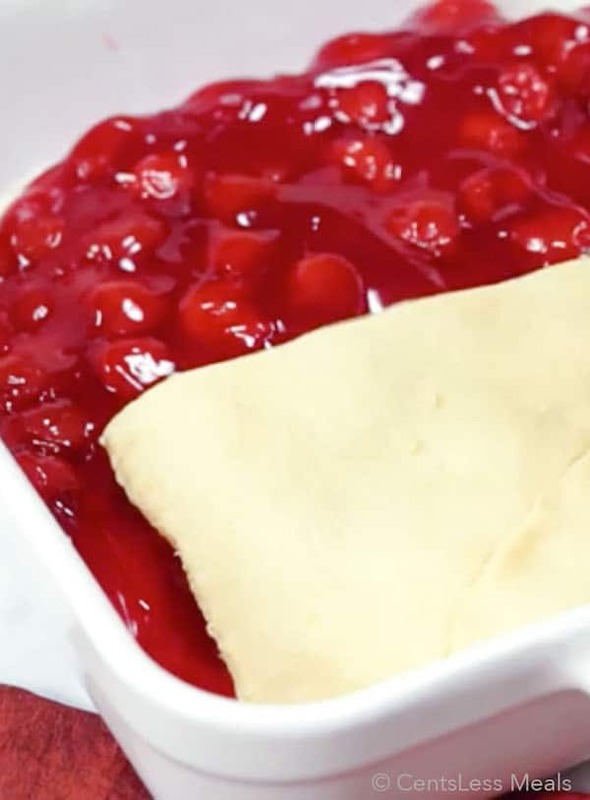 Thank you for trying this cherry cream cheese bake. Thanks for the easy recipe. I love cherry pies but this one’s even better. 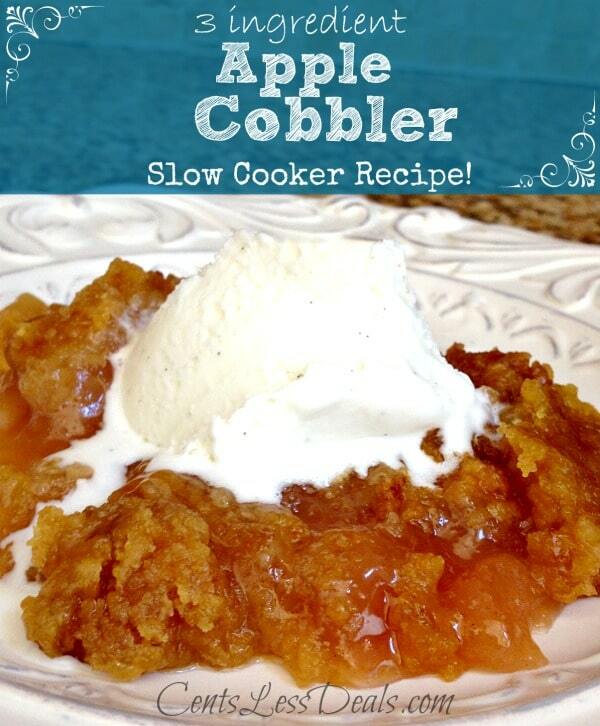 So happy to hear that you love this recipe Jennifer! There are several unanswered questions here that would be helpful to get answers to! Is there something specific I can help with? Tasted good, but the crescent rolls came out barely cooked. I think maybe bottom dough should be baked for a few minutes before adding cream cheese and cherries. Also, I think the butter on top should be omitted because it just makes the top dough soggy. I will try again, but probably make those adjustments and see if the dough cooks better. If not, then I’ll try another recipe. Hopefully it works for you Debbi. One thing to consider is to check your oven temperature with an oven thermometer. Making tomorrow but, for the future on the butter used. Not mentioned salted or unsalted? Did they have a correction on the amount of vanilla? Like someone already asked? 2T or 2tsp of vanilla? This is really very good; almost sinful! I’ve also made it with strawberry and plan on trying peach next. However, the bake time should almost be doubled if you want the dough on the top and bottom baked and not raw. 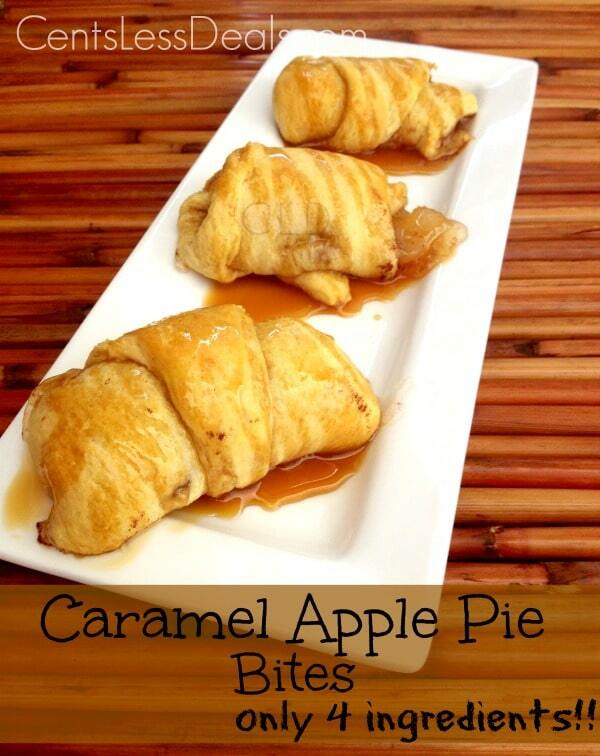 I made this with Apple pie filling and it was wonderful! I have also had this with out the fruit filling and also once again with out the fruit filling but it had brown sugar and pecans on top! This recipe can be made so many different ways. It’s great! I made it with lemon pie filling. Delicious both hot or cold. You can use a 21 ounce can of filling, but any size will work. Do these need to be refrigerated after made? Yes, I would refrigerate these. 2T of vanilla is too much. I wondered if the author meant 2tsp. The vanilla overpowered the sweetness of the cream cheese/powdered sugar combo. Do you serve this warm or chilled? This was almost as good as I thought it would be — just wish I had seen the tip about baking the bottom crust 1st because that’s my solution for next time (bottom crust this time was not baked through, even though I left it in for an extra 5 min.). Also wondering if 2 TBSP of vanilla isn’t too much? Would like to hear other comments on that issue in particular. Still had a lot of compliments, though! This looks like “heaven on a plate”!!! Got to try it out! Thank you for sharing. My dad has made this a few times. He’ll often bake the bottom layer of the crescent rolls for a few minutes before adding the filling and baking the whole thing. Hi would like to know what is crescent roll?